Meet Patel Conservatory’s Resident Drumfluencer Meghan Lock. – What Will My Gift Support? Meghan Lock’s formal musical life began like most, with piano lessons at the bright, young age of five years old. But, when her parents realized she was spending more minutes in time-out for not practicing than minutes she was playing, they took a different route. “Before this competition, my drumfluences were all male and the typical names you would hear from any jazz drummer … Art Blakey, Ari Hoenig, Max Roach, Chris “Daddy” Dave and Tony Royster, Jr. 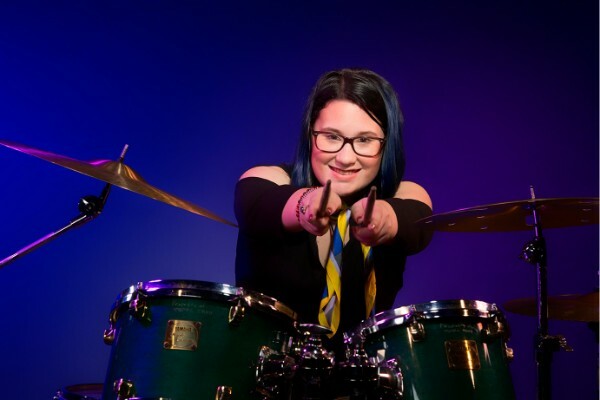 However, through the HLAG competition, I was exposed to so many talented female drummers from all over the world – it was truly inspiring,” Meghan says. Reading, gaming and longboarding. “I’ve read the Harry Potter and The Unwanted series five times each. Godspell. “I was asked to play drums for the production – hands down one of my favorite gigs!